Generally speaking, when you compare common decking materials there are three choices: Cedar, pressure-treated wood and composite decking. Neither one is a bad choice. They vary in looks, durability and cost -- each with its own advantages and disadvantages. Below, we’ll talk about all three, and which one will best suit your needs. Cedar is a popular choice because it is a less expensive alternative to redwood, while still being highly rot and moisture resistant. When weathered, cedar takes on a silvery gray appearance and easily accepts stains. Generally, most professionals figure a lifespan of 15 to 20 years for cedar decking. Cedar is a relatively soft wood, so consideration should be taken if used on stairs or areas where furniture and other objects will be dragged around constantly. Cost-wise, cedar is slightly more expensive than pressure-treated wood, but less expensive than composite. Of the three, it is the most natural choice, which means that it smells good and has natural, authentic warmth that composites cannot replicate. Pressure-treated decking is arguably the most popular choice in modern decks. Of the three, it is the least expensive, though structurally the strongest. Most treated lumber is made from fir and pine. The chemical treatment that the wood receives makes it weather and insect resistant, in addition to long-lasting. 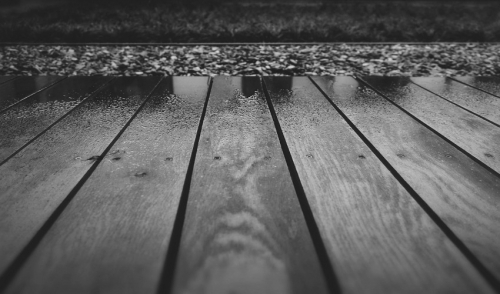 At the very least, pressure-treated lumber is especially well-suited for the structural portions of decks, such as the joists, posts or beams. In fact, many composite decks use pressure-treated lumber for their support systems. Treated lumber is widely available, making it an accessible choice. On the downside, treated lumber has an unnatural color, and by definition, contains chemical preservatives. Some less expensive treated wood often contains a lot of moisture and is known to warp and twist as it dries. This can have a huge effect on the look of your deck as time goes by. Composite lumber is the true maintenance-free option. It is weather resistant, lightweight and will never need to be sealed. Though it is not a natural material like wood, it is still a “green” choice, since it is often manufactured from recycled plastics, sawdust and wood chips. Once installed, you can rest assured that it won’t rot or twist like wood. Composite lumber is very easy to clean and keep that way. Plus, it’s available in an ever-increasing variety of colors and textures, which come close to simulating the look of real wood. Some drawbacks are that composite decking can be quite expensive --though when tempered with the fact that zero maintenance is required in the future, the added expense becomes more reasonable. Composite materials require more substructure compared to wood, and can sag without proper support. Some brands are cheaper than others and it shows. For example, some are slippery and the appearance is more noticeably artificial.